Feel free to contact & ask any query related to products, installation & demo. Card Based Time Attendance Machine is a standalone card based Time Attendance Machine. RFID cards can be used for marking attendance. 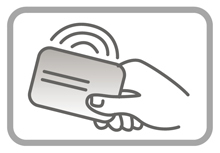 Every employee can be given RFID cards which will be uniquely identified by our card based time and attendance machine. We are specialized in various security solution Time Attendance System, Access Control System, CCTV Surveillance System, Intruder / Burglar Alarms, Fire Detection Equipment's & Accessories, Metal Detectors and various other types of industry related security system. Sign up to our newsletter and get details & updates straight to your inbox! © 2015 Developed By: NAVNEET. All Rights Reserved.